I'm back, with all thanks to Andrew for making it possible in the first place. He also took a picture of me, at my insistence, in my opera-going finery (while declining to be photographed himself). Hm, rather a blurred picture, too. Sorry about that. No apology needed -- you should see how many of my shots of the Cotswolds I messed up, one way or another. 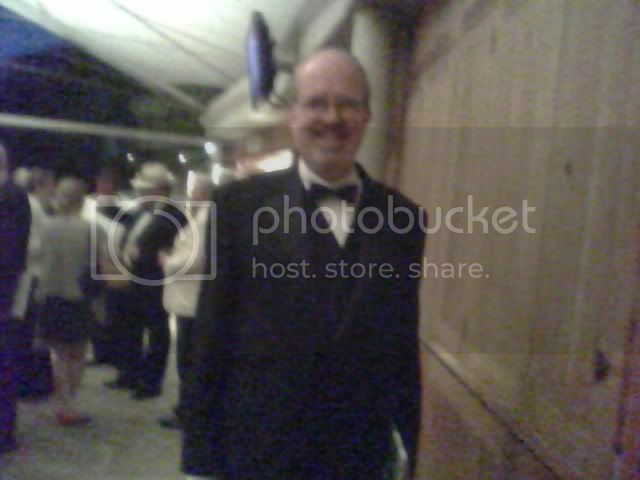 A mobile phone with a tiny screen just isn't optimum for quality photography, and I'm delighted to have any documentation of my presence at Glyndebourne -- it was such a dream combination of good food, good company, and near-ideal opera in perfect surroundings, I might think I dreamed it. The profile picture on Facebook is sharper. Just smaller, Kay -- which itself helps with focus. Should I report something more? Both operas (Billy Budd, Cosi fan tutte) are among my very favorites, both were excellently produced and performed. Both in what might be described as variable unit sets, the former rather monochromatic in scheme, the latter extremely colorful. Appropriate, in both cases. The casts were splendid, and in the Glyndebourne tradition cast with stars-of-the-future more than established stars (though there have always been a few of those too). The name I knew best was John Mark Ainsley as Captain Vere. And the justly revered Sir Charles Mackerras conducting this Cosi production for the first time. Glyndebourne is definitely my favorite place in the world to see an opera, and I can't recommend it strongly enough. Beautiful site, beautiful exterior and interior of the house, PERFECT acoustics for all kinds of music, great sight lines from many parts of the house, ultra-high performance standard, great restaurants for the dinner intermission... I could go on and on. I haven't a single negative to offer. And when are you going to announce the hirsute news you just posted on Facebook? I can't imagine that anybody cares. Only two here have ever seen me in person. Besides, I may grow it back next week. You know, it's funny but multiple years of back and forth on various message boards and you do KNOW people you've never "seen." I find myself wondering what's become of some of the old GEnie regulars, who popped in here for a while and then disappeared. Generated in 0.035 seconds in which 0.016 seconds were spent on a total of 14 queries. Zlib compression disabled.